For the first time in my orchid growing career, I understand why so many books on orchid culture discuss the difficulty of growing orchids under low humidity and how to counter the effects of low humidity. Typically, the only time humidity is lower than the ideal for orchids in most of the Southeastern U.S. is in winter, when days are short and the sun is low on the horizon. Raising humidity in winter-spring in a closed greenhouse is relatively easy with a humidifier or various types of misters. Keeping humidity up in late spring and summer has proven to be far more difficult. Most orchid growers know that orchids prefer good humidity, but what is “good humidity”. 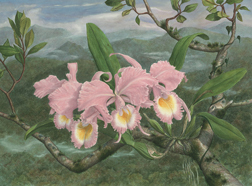 The books say that the perfect humidity for most orchids is around 60%. Leaves open their stomata to let in Carbon Dioxide and evaporate water to cool themselves during the heat of the day. The ideal humidity is when the amount of water in the air is such that orchids undergoing photosynthesis are able to move enough water from the medium into their roots and to the leaves to compensate for the water lost to the atmosphere. The warmer the air, the faster the plant can photosynthesize, but the more water the orchid will need to evaporate to keep from overheating. When the need for water exceeds the supply, most plant leaves wilt, but the rigid leaves of most orchids simply overheat. Thus, the same relative humidity levels in winter (cool) will not have the same effect as in the summer when it is warm or hot because orchids are not growing as fast when light levels are lower and so do not need the same degree of cooling. This past spring, relative humidity levels in the Southeast have been at a record low, not for just a day or two, but for months. Hobbyists with small greenhouses or windowsills have had to water with great frequency and still watch their orchids show signs of water stress. Most of us in the South that have been hoping for an increase in humidity should remember the old expression; “Be careful what you wish for” because high humidity is a normal part of the Southern climate and will be here soon. It is much harder to manage high humidity than low humidity. The primary difficulty with hot humid summers results from the low evaporation rate as humidity approaches 100%. The closer the relative humidity is to 100%, the lower the rate of evaporative cooling both in the leaves (via the stomata) and from the leaf surface. Not only does water stand in the crowns or on leaves until nightfall, but the evaporative cooling used by plants to cool leaves is also very ineffective. As the temperature and humidity rise, orchids can be shaded more and air flow increased to limit over heating and increase cooling. If not, orchids will become stressed, even if excess water on plants at night is avoided. Stressed orchids are always more susceptible to attack by disease and pests. Fungal and bacterial problems will develop quickly in the heat, especially on thin leafed orchids or on orchids that prefer cooler conditions. My attempts to grow cool-loving masdevalias and other aliens to high heat always fail this time of year, with few exceptions. Orchids in baskets, especially vandaceous types thrive in the high heat and humidity as long as there is enough air movement. This time of year, the few orchids in my collection that are reputed to be intermediate types are placed in lots of shade and misted on the hottest days every morning. A fan aimed right at them insures not just the maximum cooling, but that they will be dry by the evening. If you use distilled or DO water in your misting, there will also be few rots that accompany the extra misting. Bacteria and fungi do not grow well in water with absolutely nothing in it. New Product - Moist greenhouse conditions are tough on wood, even treated wood. After 13 years, some of the treated wood in my benches began to fail and was replaced. A product available today at a good price is plastic coated, steel shelving. It only comes in white, but is very attractive. Most new homes use this product in closets or in cabinets. Not only is this a strong product, but the plastic coating prevents rust. It is non-toxic, unlike many treated wood products, and slugs and snails seem to dislike moving across it. Even better, is the open nature of the shelving, which lets light through to shelves below and more importantly, allows additional air movement over slatted shelves. It comes in different widths and lengths and is relatively easy to custom cut with bolt cutters. It would be ideal for use indoors as well.